Projects – Tarrangower Cactus Control Group Inc. In 2017 the TCCG completed a project to map Wheel Cactus in Victoria. A total of 345 locations were mapped during the project. These were distributed across 29 Local Government Areas (LGA’s) and 105 Localities. Of these, 237 were new records. Click on the images below to view the full size maps. TCCG have found that many of the local private properties with the worst Wheel cactus infestations are owned by absentee owners, weekenders and new landowners. 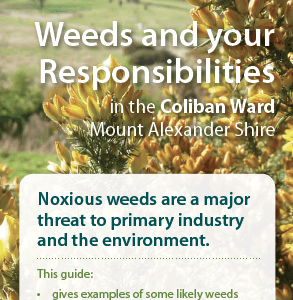 They hope that by engaging with and advising new property owners about noxious weeds as soon as they have purchased land, that more will actively control their weed infestations. In 2017, TCCG successfully applied for funding from Mt. 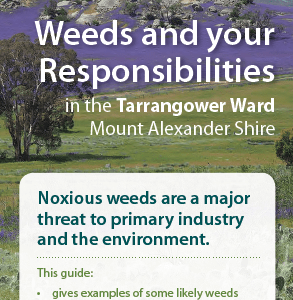 Alexander Shire Council to produce 5 individual brochures about weed management, one specific to the Shire’s 5 wards. 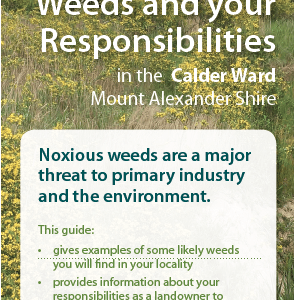 These brochures highlight the most problematic noxious weeds specific to each ward, and remind the property owners of their legal responsibilities to control noxious weeds on their land. The brochures also provide some details for species identification and links for more information. 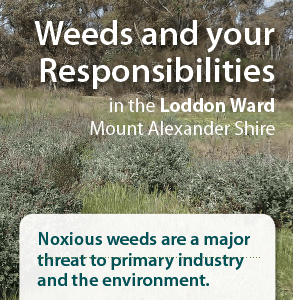 Thanks to all the neighbouring Landcare Groups in our Shire for contributing localized priority weed lists and photographs, and Connecting Country and North Central Catchment Management Authority for information, photos and very helpful advice. During 2016, TCCG collaborated with an Honours student (Samantha Searle) at Federation University, Ballarat Victoria, whose project studied the conditions required for germination of Wheel Cactus seeds. Samantha studied such variables as temperature, moisture, soil pH and salinity and light exposure. She also studied means of breaking down the hard outer coating of the seeds by comparing manual and mechanical scarification. The conclusions from Samantha’s results confirmed that Wheel Cactus (Opuntia robusta) is capable of growing in a wide range of climatic and soil conditions, thus reinforcing what a major threat this species is to the Australian environment. The aim of the trial was to compare the differences between using the herbicides Glyphosate and Daconate for injection of Wheel Cactus plants. The trial was carried out on property on Back Cairn Curran Road which had a dense infestation with various sized plants. Several duplicate plots were chosen which were easily accessible, near each other and had similar sized and/or number of plants. The cost of Daconate is approx. 2.5 x more than the cost of Glyphosate but each plant used approx. 2 x more volume of Glyphosate, therefore the actual cost of both was very similar. The time taken for a plant to die was approx. 3 x longer using Glyphosate and was much more likely to need follow-up injections than when using Daconate. 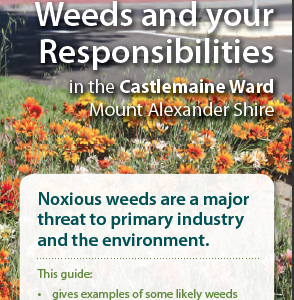 A group of Venturer Scouts from Castlemaine carried out a trial testing different concentrations of the herbicide glyphosate. They marked out several plots containing approximately the same number and size of Wheel Cactus plants and allocated them to different concentrations, ranging from 0%, 5%, 10%, 15%, 20%, 25% and 33%. The plants in each plot were injected with the appropriate concentration and monitored for the next 6 months. The trial showed very effective treatment using both 25% and 33% glyphosate. During 2013 and 2014, the Tarrangower Cactus Control Group carried out a monitoring and evaluation program. The aim was to assess the effectiveness of the glyphosate injecting technique used by the volunteers at our regular monthly field days. Glyphosate diluted at 1:3 in water and 2-4ml injected into lobes was used on each field day. A Field Day Record Sheet was completed recording details of weather, terrain, cactus growth patterns and dispersion. A section of the site that was representative of the whole was also chosen and pegged out, which became the monitoring plot. The total number of wheel cactus plants within the monitoring plot was recorded, plus a count of the total number of treated cactus within the plot. Initially the kill rate at each site was determined each month for 3 months, recording the number of plants unaffected by injection with glyphosate, the number damaged, dead and re-growing. However it was later decided that a 3 month period was not long enough to properly determine the kill rate, so the follow-up counts were changed to 1, 3 and 6 months after injection. The plots were also photographed at each time point. This large variation was probably partly due to the fact that 3 different volunteers recorded the data and used varying numbers of plants in their defined plots, and therefore the sample size was not consistent. Kill rate extremes were also likely affected by the large variation in the size of the plants in the defined plots, as some plots contained only small plants while others contained mostly large plants. The conditions recorded were also very subjective and measures not well defined, such as the water content of the plants. There was no obvious effect of uptake of the herbicide from weather conditions as the recorded conditions were very similar on most field days, e.g. no precipitation, low-medium humidity, little wind and cloud cover, similar temperatures and times. At either the 3 or 6 months end point, only small and medium sized plants were completely dead. Most of the large plants were not dead and still partially growing, which was most likely because not all outer lobes of these plants had been injected. This was probably due to the physical difficultly for the injector to reach all of the lobes at the time of first attack. However when all the outer lobes of a plant were injected, 33% Glyphosate proved to be a very effective herbicide. All record sheets and photo results can be viewed on the Archives page. A Student Feedback Questionnaire has also been developed for use with students groups. It explores their knowledge of cactus and control methods prior to the field day, what they learned from the field experience, what aspects they liked the most and the least about the experience and whether they would come again and if they would recommend such field days to other students. All record sheets ans feedback results can be viewed on the Archives page. The current method of controlling immature wheel cactus is to squash them completely underfoot if they are very small or to dig them up and remove them. In some infested areas there is a “sea” of immature cactus and digging them up is extremely time consuming. Some infestations are also in difficult terrain and/or accessible only on foot. Carrying buckets in and out can be quite difficult. A system of follow up control using a spray would be most valuable in such areas. Australian soils are deficient in copper and a couple of members of the group decided to experiment with sprays of copper solutions to determine the impact on immature wheel cactus. In 2012 a pilot was conducted with sprays of three copper solutions (copper sulphate, copper carbonate and copper hydroxide). The trial yielded promising results for copper sulphate in the form of Bluestone. Refer to Cactus_Copper_Spray_trial_2012 . A second trial with 3 doses of sprayed copper sulphate on immature plants was followed up every 4 weeks for 12 weeks with documented records of damage and kill rates plus photographic evidence. TCCG Cu Sulphate Spray record sheet 2013. Unfortunately, there was little impact except in the area where the excess spray was emptied onto the ground. In that area some immature plants had yellowed and a few had died. This prompted the third trial with copper sulphate, which is currently in progress.